The 3 day Annual Conference of Neurological Society of India (NSI) was formally inaugurated by Dr. Gopalkrishna Gandhi, Former Governor of West Bengal and Dr. S. Geethalakshmi, Vice Chancellor of Dr. MGR Medical University, in Chennai. The conference takes place at ITC Grand Chola, Guindy, from 15th to 18th December 2016. Over 1200 Neuro-Scientists from India and abroad are participating in this world class conference which has its theme as “Heritage to Modernity: An Inspiring Saga” and is hosted by the Chennai Neuro Association. In his address, Dr. Gopalkrishna Gandhi said, “I am happy to learn that Chennai has been the city where neuroscience as a specialty developed and grew and got recognized in the early 60s and 70s and continues to lead the way. The doctors from Madras, now known as Chennai, have been pioneers in all spheres of medicines including Neurology. Dr. Sridhar added, “India is amongst the most premier places globally when it comes to neurosciences and Chennai has the most number of neuro scientists in the country. The Madras Institute of Neurology (MIN) has several firsts in the country such as starting of stereotactic surgery, being the first comprehensive neurosciences institute with all neuroscience specialties under one roof, first D.M. (Neurology) course, first CT scan in the state government institute and second in a government institute in the whole country after AIIMS, Delhi and highest number of neurologists, neurosurgeons and Ph. Ds. in neurosciences. The Jacob Chandy Oration by Prof. Kenji Ohata – Titled “Advancement is Skull Base Surgery” will be on 17.12.2016, 11.35 am. Dr. K. Sridhar, Organising Secretary of NSICON 2016, Dr. Gopalkrishna Gandhi, Former Governor of West Bengal, Dr. S. Geethalakshmi, Vice Chancellor, Dr. MGR Medical University, Dr. R.C. Mishra, President, NSI, Dr. V.G. 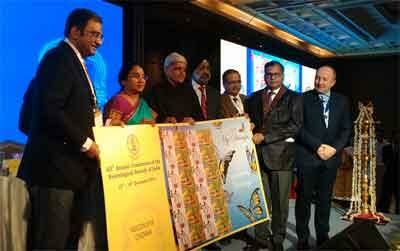 Ramesh, Organising Chairman, NSICON 2016, Dr. VP Singh, Secretary, NSI, are seen during the commemorative Stamp release of Dr. B. Ramamurthi, Father of Indian Neurosurgery.